Learn how to build a healthy salad that’s delicious, satisfying and large enough to enjoy as a meal. I hate to sound like a broken record, but I want to give a little salad background for those that are new around here. It’s no secret that I love salads. I try to eat at least one a day and I often suggest the idea of a daily meal-sized salad to my health coaching clients as well. I could spout off a variety of nutritional benefits of eating one large salad a day, but we’re all pretty much aware of the that eating lots of veggies is healthy, right? So what I want to talk about today is HOW to build healthy salad. One that is delicious, satisfying and large enough to constitute a full meal. There are few important components to think about when building a meal-sized salad. The first is making sure the salad is filling — both in size and nutrition. You can’t eat a small bowl of lettuce, tomatoes and carrots and expect to feel satisfied or full an hour later. 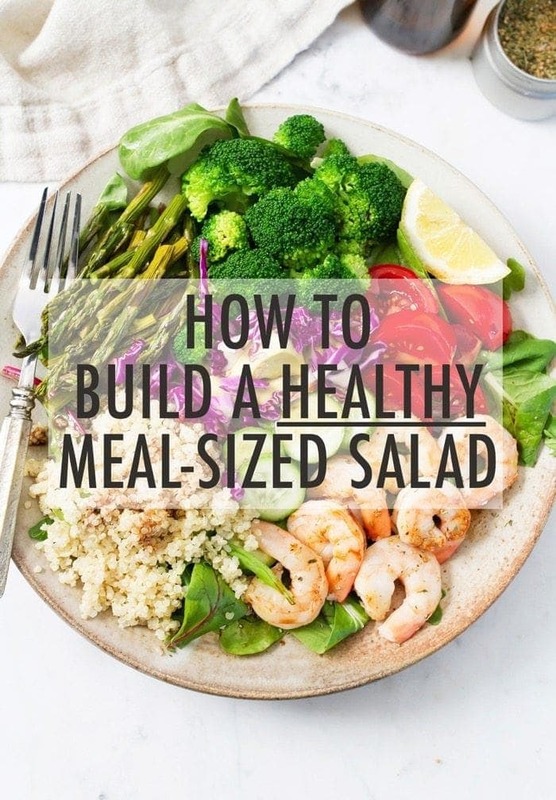 If you’re having salad as a meal it needs to be substantial in size (size definitely matters, especially for volume eaters) and you’ll also want to make sure the salad has enough calories to constitute a meal. Around 500-600 is a good place to start. The second piece of the puzzle is making sure the salad is satisfying. 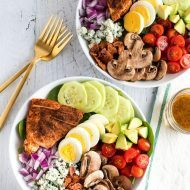 To do this you want to make sure you have a good mix of macronutrients — protein, healthy fat and smart carbs — as well as a variety of flavors and textures. I find that the toppings make all the difference. I love adding something crunchy along with something semi-sweet. These two additions make salads really satisfying to me. Find out what toppings make salad satisfying to YOU and roll with it. Of course, salads can easily turn into a unhealthy meal if you’re not careful with the toppings. Restaurants are the worst about this! Just be mindful about what you add and the portions. It can be helpful to measure some of the more caloric items (like cheese and nuts) just so you don’t overdo it. Here’s my basic recipe for how to build a healthy salad. You can use this little guide when you’re building salads at home, but also when you’re at a salad bar or ordering from a restaurant menu. Your options are endless with this one. Feel free to load your plate up and the more colorful the veggies, the better. Raw vegetables are great and add a nice crunch, but if you want to add a variety of flavor and make the salad extra satisfying I recommend adding some cooked vegetables as well. Grilled or roasted veggies add a nice charred, caramelized flavor while steamed or blanched veggies add a variety in texture. Pickled veggies are great for adding a hint of sweet/sour flavor while fermented veggies, like sauerkraut and kimchi, give you added probiotic benefits. Although not necessarily a veggie, fresh herbs are a great way to boost the nutrition and flavor of a salad as well. Try adding chopped basil, dill, parsley or other fresh herbs into your salad mix. Don’t fear carbs! 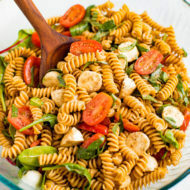 Skip the processed carbs and load your salad up with a serving of whole grain, real food carbs. Aim for 1/3 – 1/2 cup serving. This is where the healthy fats come in and there are so many options. The serving should be anywhere from 2 Tablespoons to 1/4 cup. Homemade dressing is so easy and it’s really the best option when building a healthy salad. If you don’t have time to make a dressing, simply stick with something simple. Maybe a little oil, vinegar or citrus juice, salt and pepper. You can also use things like salsa or hummus as a dressing of sorts. If you’re going to go with store-bought dressing look for one without a ton of sodium, preservatives, sugar and fat. If I buy store-bought dressings I look for those in the produce section that have a short ingredient list, less than 50 calories per serving (which is typically 2 Tablespoons) and under 5g of sugar and fat. To make the salad making process really easy it can be helpful to buy pre-chopped veggies as well as cooked protein options (like canned beans) OR spend some time on Sunday prepping these things yourself so you’re ready to go when it comes time to toss the salad together. The key for me to have salads keeping me full is adding protein. Goat cheese is amazing on salads too! Totally agree! Protein is essential. And yes, goat cheese is one of my favorite cheeses to use on salad!! 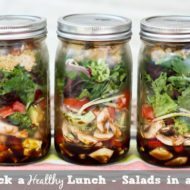 I do this for lunch just about every day and love it! It’s always different but follows your format :). My favorites are avocado, sunflower seeds and my latest obsession, sauerkraut. I just can’t get enough of it! Thanks for the inspiration :). Avocado, sunflower seeds and sauerkraut are some of my favorites as well! Great post, canned beans and tempeh are my go to’s for adding hearty protein. Perfect options for plant-based eating!! I love the idea of using kimchi! That really sparks my imagination for different flavor combos! Mmm, like with grilled steak or something meaty along with it. Great post and I totally agree on all fronts. Salad in the summer is my go-to meal. We make these huge salads and top them with grilled pesto chicken -so good! I never think to add a spoonful of cottage cheese to my leafy salads but this must change. It sounds so good now! Great post! I love a monster salad at lunchtime. Everyone always comments on how healthy it looks, but it’s a bonus when they say it looks colourful and tasty as well! Nuts are one of my favourite toppings but I’ve just started experimenting with seeds and they make things really interesting. I think my next adventure will be mixing fruit and cheese. Love a bit of sweet & savoury! this is great info. Just one comment…quinoa is a complete protein, not a grain. It is actually a seed and kin to spinach. Definitely my salad staples! For me, making sure I have a healthy fat (avocado or tahini are go-to’s), sometimes a carb (quinoa or sweet potato) and definitely a variety of veggies! I like added shredded or roasted beets and zucchini, and lately have been adding sauerkraut and using babaganoush as dressing. I started having a plate of salad for lunch each day about 6 weeks ago. It’s great to read your post because it gives me more ideas on what to include. You’ve reminded me to add quinoa to my salads! At the moment I really like adding beets to my salads and sometimes chickpeas.